I've had these Primark trousers for absolutely months now but couldn't wear them as they were too big on the waist and I wanted them to be more of a high-waisted fit, so I recently got them altered and haven't stopped wearing them since. I love the check detail; these practically go with every outfit and they feel great quality for the price I paid. Like my last post, I've really been into my trousers lately and I want to make the most of wearing them before Spring and Summer comes poking round the corner. I really love the colour palette of this entire outfit. 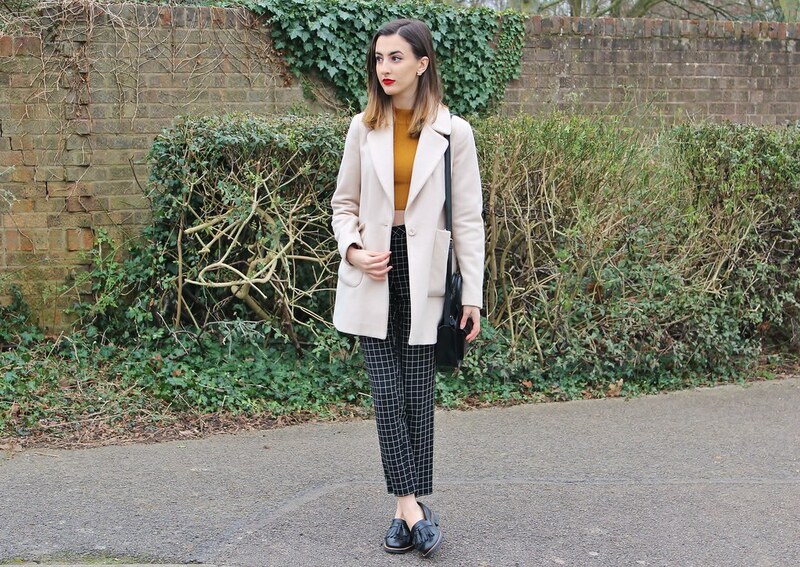 I get that it's a very Autumn/Winter tonal feeling going on, especially with the Mustard coloured top with the deep Red lipstick and the Beige tailored Zara coat but I just don't think I'm ready to let Winter go just yet - I love a bit of layering! Although, I guess in the UK we won't be seeing Spring for a good few months anyway.